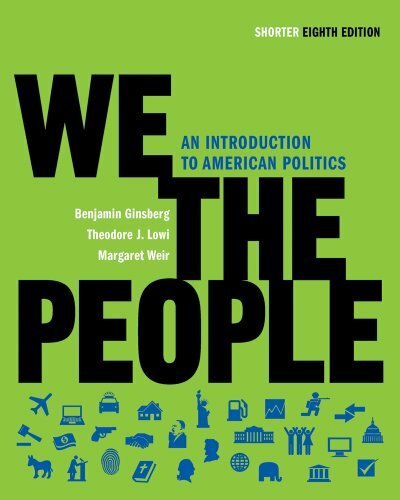 [PDF] We the People: An Introduction to American Politics (Shorter Eighth Edition) | Free eBooks Download - EBOOKEE! Description: Politics is relevant. The best book for engaging students in American politics is also the most effective for helping students study and learn. We the People emphasizes the ways that government and politics matter and the ways that people can get involved in politics and influence government. In the Eighth Edition, We the People offers a more contemporary approach to engage students in American politics with new features based on how todayâ€™s students study and learn. New pedagogical features, such as highly visual â€œWho Are Americans?â€ units and Focus Questions that recur throughout the chapter, help students engage with the material and succeed in the course. No comments for "[PDF] We the People: An Introduction to American Politics (Shorter Eighth Edition)".